It’s official- Researchers map the role of microbiota in the immune system. The human body is inhabited by billions of symbiotic bacteria, carrying a diversity that is unique to each individual. The microbiota is involved in many mechanisms, including digestion, vitamin synthesis and host defense. It is well established that a loss of bacterial symbionts promotes the development of allergies. Now, researchers at the Institut Pasteur have succeeded in explaining this phenomenon whilst demonstrating how the microbiota acts on the balance of the immune system. The new study shows that the presence of microbes specifically blocks the immune cells responsible for triggering allergies. The study is published in Science. Previous studies have shown that the hygiene hypothesis suggests a link between the decline in infectious diseases and the increase in allergic diseases in industrialized countries. Improvements in hygiene levels necessarily lead to reduced contact with microbes that is paralleled by an increased incidence in allergic and autoimmune diseases, such as type 1 diabetes. Earlier epidemiological studies have substantiated this hypothesis, by showing that children living in contact with farm animals, and therefore with more microbial agents, develop fewer allergies during their lifetime. Conversely, experimental studies have shown that administering antibiotics to mice within the first days of life results in a loss of microbiota, and subsequently, in an increased incidence in allergy. However, until now, the biological mechanisms underlying this phenomenon remained unclear. The current study shows that, in mice, symbiotic intestinal microbes act on the immune system by blocking allergic reactions. The team explain that several types of immune response can be generated in order to defend the organism. The presence of bacterial or fungal microbes provokes a response from immune cells known as type 3 cells. They go on to add that these immune cells coordinate the phagocytosis and killing of the microbes. However, in the case of infection by pathogenic agents that are too large to be handled by type 3 cells (such as parasitic worms and certain allergens), the cells that organize the elimination of the pathogen, but also allergic reactions, are known as type 2 cells. The current study has shown that type 3 cells activated during a microbial aggression act directly on type 2 cells and block their activity. Type 2 cells are consequently unable to generate allergic immune responses. This work demonstrates that the microbiota indirectly regulates type 2 immune responses by inducing type 3 cells. The data findings explain how an imbalance in microbiota triggers an exaggerated type 2 immune response normally used to fight large parasites, but that also leads to allergic responses. The researchers surmise that these findings represent an important milestone in understanding the balance between various defense mechanisms. they go on to conclude that in terms of allergy treatment, a hitherto unexplored therapeutic approach consists therefore in stimulating type 3 cells by mimicking a microbial antigen in order to block allergy-causing type 2 cells. A Cluster of Type 3 Cells in a Mouse Colon. 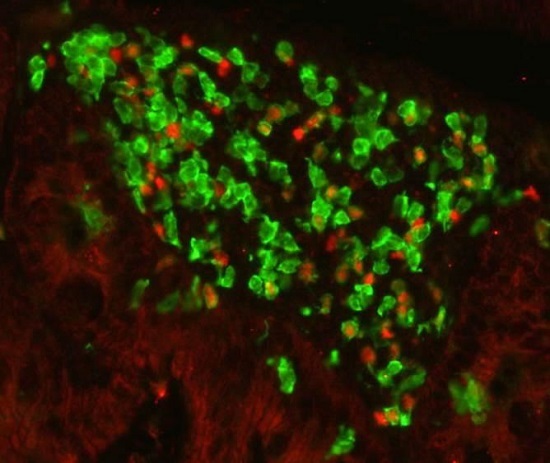 A cluster of type 3 cells (shown in green) in a mouse colon. These cells are induced by the microbiota and block type 2 allergic reactions. Credit: © Institut Pasteur.